NEW YORK -- A man who set off small bombs in two states, including a pressure cooker device that blasted shrapnel across a New York City block, was sentenced Tuesday to multiple terms of life in prison. Ahmad Khan Rahimi, a naturalized U.S. citizen who was born in Afghanistan and lived in New Jersey, injured 30 people when one of his bombs exploded in Manhattan's Chelsea neighborhood on a September night in 2016. A second bomb planted nearby did not detonate. That blast happened just hours after a small pipe bomb exploded along a Marine Corps road race in Seaside Park, New Jersey, frightening participants but injuring no one. The bombings triggered a two-day manhunt that ended in a shootout with police in Linden, New Jersey. Rahimi was shot several times but survived. Federal prosecutors said in court papers that Rahimi has not shown remorse and had tried to radicalize fellow prisoners at the federal jail in New York where he has been imprisoned since his arrest. "He is proud of what he did, scornful of the American justice system, and as dedicated as ever to his terrorist ideology," they wrote. 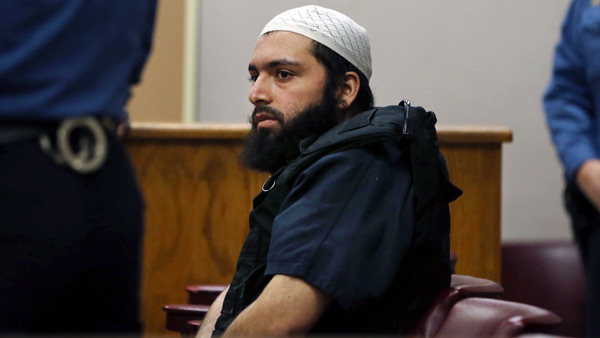 Rahimi, given a chance to speak at his sentencing, said: "I don't harbor hate for anyone." Rahimi, prosecutors said, gave inmates copies of terrorist propaganda and jihadist materials, including speeches and lectures by al-Qaida founder Osama bin Laden and Anwar al-Awlaki, a U.S.-born cleric who inspired attacks on America and was killed in a U.S. airstrike in September 2011. Rahimi also allowed some inmates to view materials on his laptop or provided electronic copies as he spread "The Book of Jihad," bomb-making instructions and various issues of a propaganda magazine. Defense attorney Xavier Donaldson said that Rahimi had once aspired to be a police officer and worked as a security guard after studying criminal justice at a community college. "It was Mr. Rahimi's belief that he could help people while employed in a position that would guarantee him some type of pension," Donaldson wrote. While imprisoned, Rahimi has completed classes in business, entrepreneurship, and drama, Donaldson wrote.